Galicia in the north west of Spain has a rugged coastline of rocky outcrops and cliffs, which are fortunately tamed by a myriad of pristine beaches. These beaches are some of the best in the country, and enjoy a far lower tourist population than their Mediterranean counterparts. The very geography of the land often dissuades the casual beach user, unwilling to brave the rock face for the golden sands beneath. All year long, but during the autumn months especially, it is blessed still further with the best surf in Europe. A decade ago, it was possible to be the only surfer for miles around, with whole bays undisturbed by swimmers or sunbathers. Now, surfing has exploded in Europe and Spanish surfers travel from all over the country, clambering down rocky facades to grab some of the large Atlantic waves that role in with a steady wind on one of the widest swell windows in Europe. 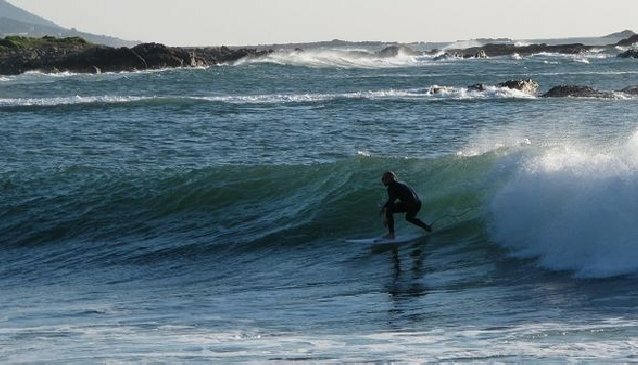 Surfing is now one of the top activities in Galicia. There is still plenty of sea to go around and longer, bigger and less crowded waves are your reward for getting on your board here. In the deep Atlantic water, there is never the question of not enough break here; you are much more likely to ask where to find one small enough to handle. Some of the most rewarding and accessible surf can be found at the Patos and Ferrol beaches, which are the most popular in the whole Vigo and Baiona area for surfers and sunbathers, with two great schools ready to accommodate any level of surfer with flexible tutoring packages throughout the year. The Patos Surf Company has established itself in all aspects of Galicia’s surf scene since it was founded in 1989, and has even exported its brand to Brazil. Patos Beach hosts the world famous Pantin Classic PRO event in September each year, where international surf legends come to earn some valuable points at the end of their season. There is also a renowned Patos Surf and Bodyboard team that competes all over the country. But don’t be alarmed, you won’t be competing just yet; the school has a large variety of programmes taught by experienced teachers ranging from a single one-on-one season to a twenty day intensive group course. Or, if you would rather, just rent a board for €7, take your own pace and hangout at their bright yellow beach shack. Novalbos is a renowned local surf shop, associated with the Patos Surf School and has stores in Vigo and Baiono to kit out the growing community here. They can serve everything you need for a beach adventure holiday, with boards and kites of all sizes. They even have a beach webcam to check up on the waves before you pull on a wetsuit. Prados Surf Escola, is the other school that shares the beach here, they offer paddle surfing along with regular boards, to get you out on the water even if you don’t want to catch some breakers just yet. Hire a paddle board from €20, and you can explore the bays of Monteferro or make the Rio Minor Crossing and experience the freedom of self-propulsion. More sheltered than the battered cliffs are the flooded valleys which the locals call ‘rias’ in their native Gallego, meaning something like a fjord in Norway. The rias give Galicia its broken outline and sprawling deep bays that jut deep into the coastline, creating new waterways and wetlands. The Prados school makes good use of the sheltered bay to teach beginning group classes. From Baiona, you can even take the ferry to the nearby Las Islas Cíes, a deserted island of true natural beauty that was once a pirate smugglers’ hideout. Its idyllic forests and beaches are open only in the summer months, and as the island is accessible only by boat, the tourists are generally kept at bay. There is a campsite in the middle of this unspoilt environment that is protected by its national park status, as well as its isolation. The beach’s sparkling clear waters and brilliant white sand have earned it the Guardian “beach of the year” status in 2007. Back on the mainland, while at its busiest and most eventful in the summer months, the Patos area still has a wide range of activities all year round. Being Galicia, there’s no shortage of great seafood here, so get stuck in to some serious tapas at Taperia O’druida. Spanish culture demands sociable engagement in all aspects of life; surfing and eating especially. So, you’ll no doubt have some new friends made on the waves to share your mussels or cuttlefish stew with. For the more adventurous, there are many places to find ‘the wave less travelled’ in the Baiona area, but one of the best secluded bays also happens to have a brilliant restaurant and backbackers’ hostel called Aguncheiro. Sitting under a canopy of vines at the terrace that overlooks the Mourgas port, this is an ideal place to unwind and meet new friends. You can get a bed here in one of its three spacious rooms and wake up to this view to inspire you before you hit the waves. For somehwere to stay Hotel Miramar is a comfortable hotel with a Moorish façade, ideally located in the thick of things at Nigran. The best time to go would be in the late summer and autumn, when the Atlantic Ocean has had a chance to warm throughout the summer, though you’ll still need a ¾ wetsuit. The Atlantic stabilizes the temperature here, keeping it cool in the summer and mild in the winter, though offshore winds and rain are fairly persistent year round. However, the more sheltered southern part of the Rias Baixas is generally warmer than the rest of the coast, and may stay at 24°C in autumn if you’re lucky.